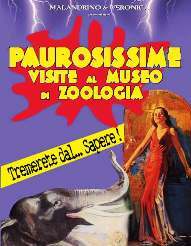 Billed as paurosissime visite – very scary visits – at the zoological museum of Bologna, this off-beat tour combines theater with a museum visit in a strange and unsettling atmosphere. Surrounded by stuffed elk heads, jars of snakes, and odd animal relics, the visitor is invited to follow a troupe of wacky tour guides and strange creatures on a theatrical tour of this unusual museum. Though not recommended for the fainthearted, the idea of attracting new visitors to seldom visited museums is an innovative one, so breathe in the scent of formaldehyde as you penetrate the depths of this fascinating museum. The brainchild of actors Roberto Malandrino (Emanuele’s nephew!) and Paolo Veronica, the very scary visits follow the recent success of their theatre pieces performed on public buses in Bologna. Through February 27, 2011 at the Museo di Zoologia, via Selmi 3, Bologna. Not recommended for children under 7 years of age, the squeamish, and those who are easily frightened or traumatized.